Will Johnston has practiced in West Saint Paul, Mendota Heights, South Saint Paul community for nearly 15 years. 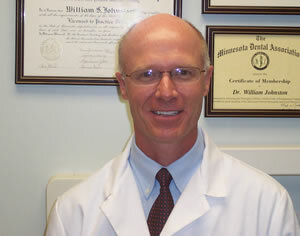 He received his BA at St Olaf College in 1986 and his dental degree from the University of Minnesota in 1990. After a three year residency on the East Coast, he and his wife returned to Minnesota to start his practice in West Saint Paul. Dr Johnston is highly trained in all areas of general dentistry and committed to continuing education, having completed hundreds of hours of advanced training. He is a member of the American Dental Association, Minnesota Dental Association, St Paul District Dental Society, and the Dakota County Study Club. He and his wife have two children and reside in Mendota Heights . He enjoys skiing, running, golf and coaching his children's teams.